Here are my entries for the May lotto. I mailed my 4 butterflies to Elizabeth today so hopefully they will arrive in about a week or so at your door. Thanks for all the work you do with the lotto Sophie. It is much appreciated. 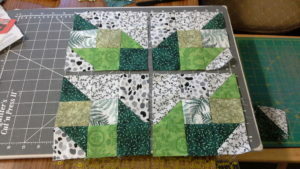 The green on white print you used for one of your leaf fabrics makes your blocks a good example of a “muddled” block, where the pattern is a little unclear because of how that fabric blends with the background squares. This kind of muddled block is often found in antique scrap quilts. When the blocks are mixed with less-muddled blocks, the pattern will be reinforced and you will “see” the leaf shape more clearly. I often include blocks like this in my scrap projects. I think they make them feel somehow more authentic.